Compare prices from several car hire companies in Salou and find the best price for car rental. Our prices always include unlimited mileage and insurance. Tarragona region of Spain that belongs to a location right in northeastern Spain. The city is located on the coast bordering the Mediterranean Sea. 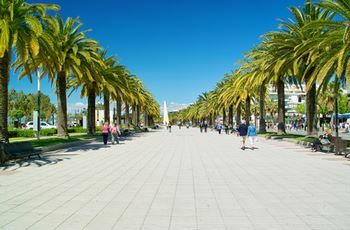 Salou is regarded as the most popular town on the Costa Daurada, and it is about 10 km to Tarragona to the north.There are approx. 25 000 inhabitants in Salou (2010). As Salou on the Costa Daurada is located, there are many tourists who visit the city to spend time on the beautiful beaches. In addition to the long white beaches, Aventura theme park Park a major attraction, along with water paradise Aquopolis. Salou hosts several festivals each year. There is no more than approx. 10 km to Reus Airport in the north. From here you can fly to cities like Marrakech, Dublin, Majorca and London.